The Heartland Marimba Quartet (HMQ) is the primary performing ensemble of Heartland Marimba. Established in 2016 by acclaimed marimba soloist Matthew Coley, the group seeks to give a platform to the music of American composers in its programming, and continues to expand its repertoire with works from composers worldwide. 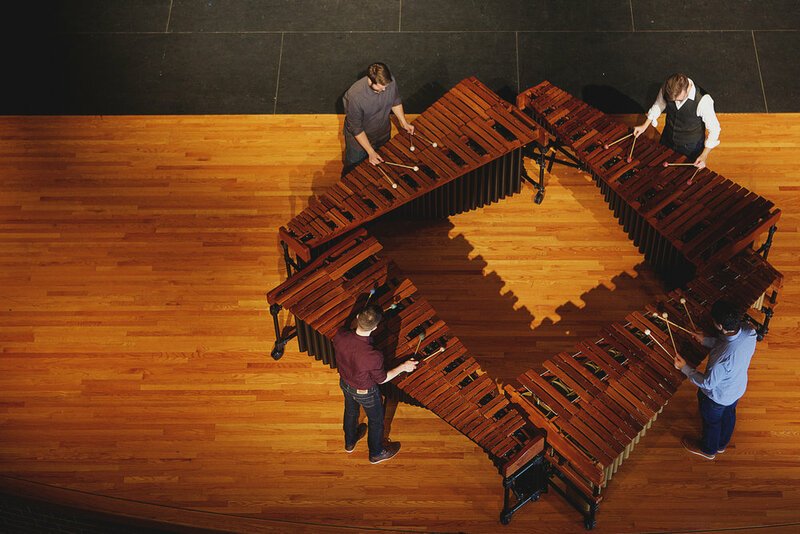 Comprised of four distinctively creative forces, Matthew Coley, Michael J. Jones, Joe Millea, and Andrew Veit, HMQ exemplifies Heartland Marimba’s mission to develop and disseminate the classical marimba art form in both academic and community contexts. In 2018, HMQ had the honor of being the ensemble in residence for the Society of Composers National Conference in Tacoma, Washington. While there, the group premiered a new concerto for marimba quartet and wind ensemble by Paul Alan Price-Brenner with the University of Puget Sound Wind Ensemble. HMQ’s 2018-2019 season further highlighted works written for Heartland Marimba, including Alex Orfaly’s Fôr Marimbas, Steven Simpson’s Fluidity, Matthew Coley’s Rivers of Rage, and the newest addition, The Principle of Vibration by Brett William Dietz. During the 2019-2020 season they will release an album and collaborate with the Dubuque Arts Council, Millikin University Percussion, and the Minot and Dubuque Symphony Orchestras. For additional information regarding HMQ or Heartland Marimba, please visit www.heartlandmarimba.com. The Heartland Marimba Quartet (HMQ) is North America’s premiere marimba quartet and the primary performing ensemble of Heartland Marimba, a 501(c)(3) organization dedicated to developing and disseminating the classical marimba art form in academic and community contexts. Established in 2016 through the vision and leadership of internationally acclaimed marimba soloist Matthew Coley, HMQ seeks to give a platform to the music of American composers in its programming, and continues to expand its repertoire with works from composers worldwide. Quartet members, Matthew Coley, Michael J. Jones, Joe Millea, and Andrew Veit, are each accomplished and award-winning marimba specialists from across the Heartland and Southwest of the United States. Individually, the artists have composed music for marimba, produced solo albums, and been featured performers in Japan, China, Canada, Latin America, and throughout Europe. Together, HMQ members share their knowledge and skills with students and aspiring professionals from ages 12 to 60. In fact, it is their passion for inspiring musicians to pursue studying this captivating instrument that guides HMQ’s performance setting and style in over 30 events a season. On annual fall and spring tours, HMQ conducts concerts, collaborations, and educational events at universities and high schools nationwide. The artists also serve as the primary faculty members and mentors for the Heartland Marimba Festival. In 2018, HMQ had the honor of being the ensemble in residence for the Society of Composers National Conference in Tacoma, Washington. While there, the group premiered a new concerto for marimba quartet and wind ensemble by Paul Alan Price-Brenner with the University of Puget Sound Wind Ensemble. HMQ’s 2018-2019 season further highlighted works written for Heartland Marimba, including Alex Orfaly’s Fôr Marimbas, Steven Simpson’s Fluidity, Matthew Coley’s Rivers of Rage, and the newest addition, The Principle of Vibration by Brett William Dietz. During the 2019-2020 season they will release an album and collaborate with the Dubuque Arts Council, Millikin University Percussion, and the Minot and Dubuque Symphony Orchestras. In addition to their contribution to every facet of Heartland Marimba, the artists of HMQ are deeply embedded in percussion communities across the country. Students of world-renowned and ground-breaking artists including Keiko Abe, Michael Burritt, Mark Ford, Daniella Ganeva, Brian Zator, and Nancy Zeltsman, the quartet members are passing their knowledge and skills to students and aspiring professionals from age 12 to age 60. It is, in part, this passion for inspiring young musicians to pursue studying this captivating instrument that guides HMQ’s performance setting and style. HMQ is a fierce advocate in music education and community engagement. In 2018, HMQ had the honor of being the ensemble in residence for the Society of Composers National Conference in Tacoma, Washington. While there, the group premiered a new concerto for marimba quartet and wind ensemble by Paul Alan Price-Brenner with the University of Puget Sound Wind Ensemble. The concerto was co-premiered with the Ankeny High School Wind Ensemble (Ankeny, IA) and the Waterloo West High School Wind Ensemble (Waterloo, IA). HMQ’s 2018-2019 season further highlighted works written for Heartland Marimba, including Alex Orfaly’s Fôr Marimbas, Steven Simpson’s Fluidity, Matthew Coley’s Rivers of Rage, and the newest addition, The Principle of Vibration by Brett William Dietz. Performances will also showcase the established repertoire for marimba quartet, featuring Kevin Romanski’s Fantasy, Gordon Sout’s New York Triptych, and Michael Burritt’s Marimba Quartet. During the 2019-2020 season they will collaborate with the Dubuque Arts Council, Millikin University Percussion, and the Minot and Dubuque Symphony Orchestras. In fall 2019, HMQ will release an album showcasing highlights from their 2017-2018 repertoire.